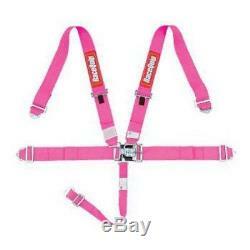 Pink Racequip Latch & Link 5-point pull-down harness. Certified for On Highway Use. Pull Down Style Lap Belt. 5 Point Design - Single 2 Crotch Strap. Double Adjustable for Ease of Installation. Wrap Around or Bolt-in Mounting. Shoulders Adjust from 20" to 62". Lap Belt Adjusts 20" to 60". Can Be Mounted By Wrapping Them Around The Roll Cage Bars or Bolting Them Using Supplied Hardware. Bolts not included this item is for one seat Part # RQP711081. The item "Racequip 5 Point Pink Seat Belts 711081 Racing Harness IMCA razor rzr USMTS USRA" is in sale since Wednesday, November 19, 2014. This item is in the category "eBay Motors\Parts & Accessories\Performance & Racing Parts\Safety Equipment\Safety Belts & Harnesses". The seller is "brykeracing" and is located in Lincoln, Arkansas. This item can be shipped worldwide.